The Hong Kong Housing Authority (HKHA), largest public housing provider in Hong Kong, provides 1.2 million public housing apartments for over 3.8 million people, or about 50% of the population in 170 public housing estates. 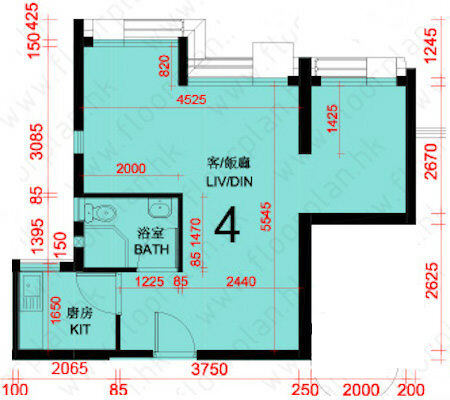 The average size of each flat is about 440 sqft. Of all the flats managed by HKHA, 740,000 of them (60%) are rental flats. Flats are rented out to eligible (individual income limit of HKD $9,500 per month) Hongkongers for about HKD $1,500 per month. Every two years, PRH rent adjusted upwards or downwards according to the changes in the overall household income of PRH tenants as reflected by the change in the income index. PRH rent is inclusive of management costs and maintenance expenses. The average waiting time is 3 years as there are about 200,000 applicants are on waiting list. One of the eight build in 1954 is the six-storey tall, 美荷樓 Mei Ho House (2,000 people living in 384 dwelling units, each 130 sqft) in 石硤尾邨 Shek Kip Mei Estate (first public housing estate) on a 0.3 hectare plot, 深水埗 Sham Shui Po, Hong Kong. The buildings were referred as Mark I H-shaped as they resembled the letter “H” (Mark I was a reference to the design of the resettlement block). Two water standpipes, fourteen bathrooms and twelve communal flush latrines had been installed at each floor. All flats were facing a long open corridor and cooking was possible at the corridors. The rental was fixed at fourteen dollars per unit per month plus an additional one dollar per month for water (HKD$15/month). In 1974, Mei Ho House underwent conversion and redevelopment. 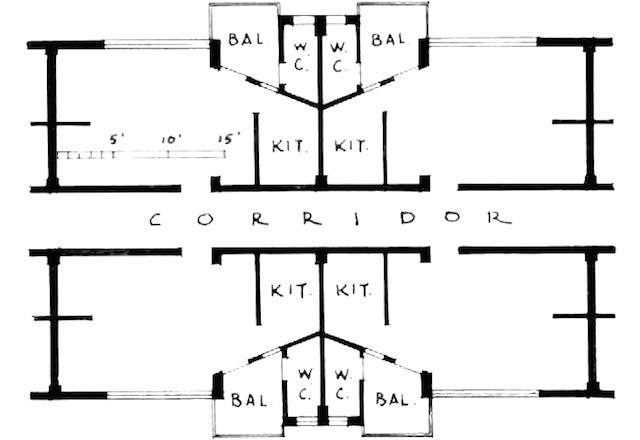 Original communal bathrooms and flush latrines located at the central connecting blocks were converted into small flats. The communal washing areas located at the middle of the two linear blocks, close to the central connecting blocks were also converted into residential flats. 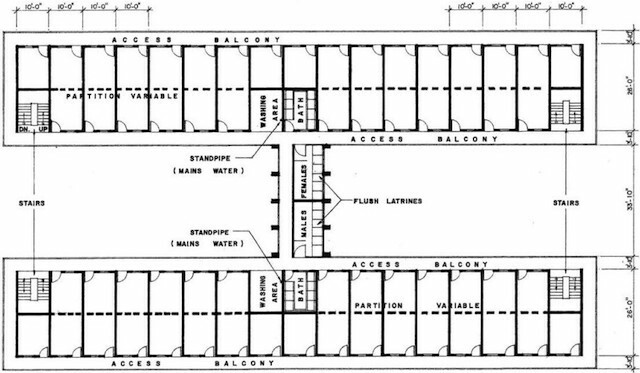 The original back-to-back arrangement of two units were combined to become one larger unit, the balcony facing outside were enclosed to form the private balcony of individual unit with private cooking space. The rear walls of each flat were provided with windows to improve natural ventilation and lighting. A central refuse chute was also added at one corner of the building. The converted Mei Ho House has 168 dwelling units. In 2012, Mei Ho House was transformed for HKD $200 million from a former public housing block into a modern city hostel. HOS was instituted in 1978 as part of the government policy for public housing with two aims - to encourage better-off tenants of rental flats to vacate those flats for re-allocation to families in greater housing need; and also to provide eligible (low to middle wage) Hongkongers an opportunity for home ownership to families unable to afford to buy in the private sector. There are 470,000 subsidised public flats sold since its inception, housing 1.5 million people. 50-years lease for the residential block starts around the day construction starts. The first batch of HOS flats became available in 1980, the six estates being Yue Fai Court in Aberdeen, Sui Wo Court in Sha Tin, Shun Chi Court in Kwun Tong, Yuet Lai Court in Kwai Chung, Shan Tsui Court in Chai Wan, and Chun Man Court in Ho Man Tin. As it happens, HOS housing also provided the Housing Authority with a steady stream of profits that more than offset the losses for running the rental housing program. By 1987, forecasting that the demand for home-ownership was on the rise, the Government launched a plan to redevelop the older housing estates, and introduced a greater choice of apartments available for purchase by public housing tenants. In December 1991, there was a huge rush to buy 6,500 Housing Authority flats in 17 projects. Flats were to be sold at a discount of 40%, the most attractive for several years. Since 1997, HKHA have also been managing the HOS SMS, which provides an alternative for public rental housing (PRH) tenants to own a home from the controlled secondary market. This in turn enables HKHA to recover more PRH flats for allocation to families in need. In 1998, HKHA introduces TPS as part of Home Ownership Scheme (HOS) which allows existing tenants in public housing estates (Tai Wo Estate was one of them) under Hong Kong Housing Authority to "own" their flats with deep discount - HKD $300,000 for a typical flat as compare to HKD $1,300,000 for a similar HOS flat. This made HOS flats unattractive and leading to a reduction in transaction of such flats. However in November 2002, in response to a weak property market which was allegedly being distorted by public housing sales schemes, the scheme was terminated after the sale of the five public estates. HOS was also suspended but SMS was able to continue but with quota. After November 2002, as the property market was on the verge of a recovery. The Severe Acute Respiratory Syndrome (SARS) epidemic broke out in February 2003. SARS receded in the July 2003, the housing market started a sustainable recovery. The weak property market was probably casued by Asian Financial Crisis rather than public housing distortion. 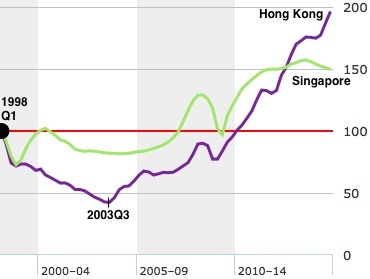 Property prices in Hong Kong have tripled (The government has a monopoly on land in Hong Kong, constricted supply is biggest factor behind the rise in prices) in a decade after 2003. This move has made Hong Kong the most overvalued property market in Asia and followed by Singapore, according to the 2015 study made by "The Economist". The Hong Kong Government announced in 2011 the resumption of the HOS. The first batch of new 2,160 HOS flats in 5 clusters (Tsuen Wan, Tsing Yi, Yuen Long, 2 in Sha Tin) are expected to be completed in 2017 and pre-sale was launched in end December 2014. 130,000 citizens (individuals with annual household income not exceeding HKD $280,000 per year) applied, so its only 1 in 60 chance to win in Hongkongers' rush for subsidised flats. A typical 50-year lease of a 440 sqft apartment will cost between $2.40M (low floor) to $2.86M (high floor) ~ SGD $450k. The Hong Kong Housing Society 香港房屋協會 is the second largest public housing provider in Hong Kong after the Hong Kong Housing Authority. It housed about 150,000 residents with built 67,000 dwelling units (of which 32,000 was for rental) in Hong Kong. The society is an independent non-profit and non-governmental voluntary agency, was formed in 1951 with a ₤14,000 donation from Lord Mayor of London. The first rental housing estate in Hong Kong by the society was 上李屋 Sheung Li Uk Housing Estate with five 5-storey blocks, completed in 1952, which was on two 0.5 hectare, triangular shaped plot of land between Po On Road and Sheung Li Uk Garden Park in Sham Shui Po District (Kowloon) to provide low-rental housing for 360 households with 1,900 tenants. The land and the building works costed about HKD$2 million. The Society took a 40 years loan at 3.5% per annum for the project or about HKD$8,000 per month to service the loan. 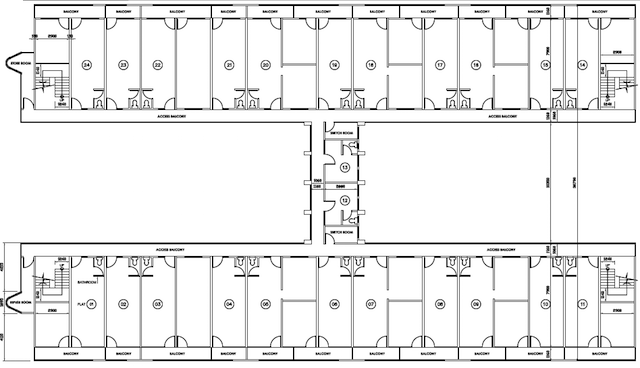 Each apartment has a floor area of about 320 square feet. And was rented out for HKD$67 per month. The Society may have collected about HKD$24,000 in rental each month. 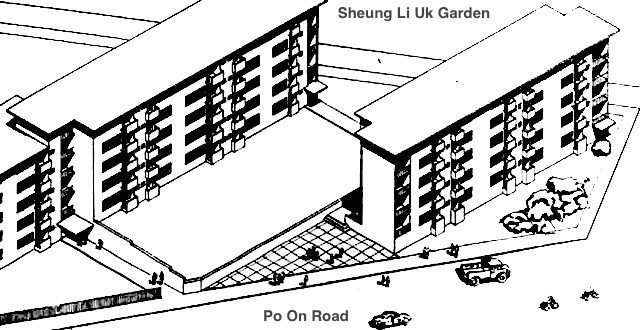 Sheung Li Uk Housing Estate was demolished 40 years later. It was redeveloped in 1995 and renamed 樂年花園 Cronin Garden (map) with seven 13-storey residential blocks (HKHS Flat-for-Sale Scheme) totalling 728 dwelling units. Cronin Garden is located about 0.5 kilometre from Sham Shui Po MTR Station.